Running Through the Passage: Shoe Review! Skechers GOwalk...Rock! I love my puppy, Spence, really I do. But he's gotten the cold shoulder from me these past few days for chewing my beloved Merrell Glove shoes (mary jane style). Gosh I loved those shoes, they went everywhere with me, I even ran a few times in them since Merrell posted that as a feature of the shoes. So when my husband held up a chewed Merrell on Saturday morning from the floor by our bed all I could do was wail "NOoooo!" and insist that I would now need new "everyday" shoes. The search was on. We went to Walmart to start (I know, I know, but I was trying to be agreeable to a cheaper alternative than my $125 Merrells) and had no luck, although I was impressed by how many of their shoes had a nice comfortable sole, however the uppers on all of their casual shoes were rigid and I could picture pretty impressive blisters forming from each one that I tried on. So, our next stop was Globo Shoes. I usually don't have much luck with this store, simply because I find their shoes tend to run pretty narrow and they never seem to have any other width options available. This time however I was in luck. They had a big display of the whole Skechers Line, and although I was wary of trying on shoes from them based on my GOrunII experience I tried on a pair of their GOwalk shoes. Wow! First of all they were just as light as the GOrunII shoes (only 4.5 oz per shoe) and even feature a very similar tread pattern. These were easy to slip on and the stretchy upper gave my toes tons of room to breathe and move. 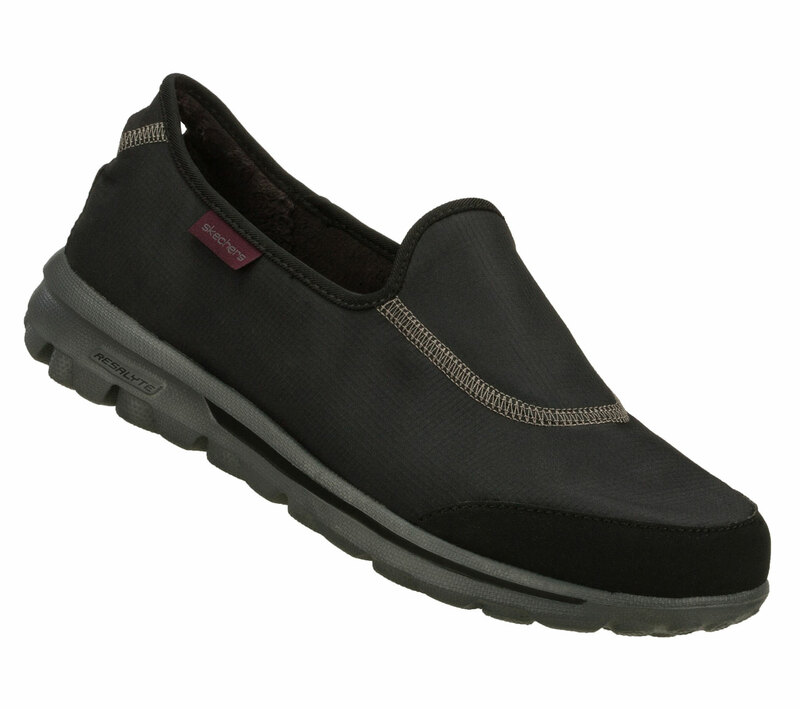 The upper is made of a soft chenille fabric that understands alot of us want to wear these barefoot. They are super comfortable. After four days of wear I don't have any blisters or hot spots. I can feel the ground beneath my feet but Skechers designed these so that even though you can still feel the ground it feels like you've got a ton of cushion underfoot. One neat feature of the GOwalk is a heel loop that allows you to grab this small hole and quickly pull the shoes on-great if you're a busy mom trying to keep up with her busy family! Skechers-you've redeemed yourself in my eyes. The GOwalk -Tech shoes get a 5 out of 5 from me. I know I'll be wearing these shoes to death...oh and they have a nice home in our front closet so Spencer can't sample them. I think I'll GOwalk! Well, I'm glad to hear there is another alternative to the vibrams if needed. Yes, well, puppies will be puppies..lol. I was a bit wary of trying skechers too but I was really glad I gave these a try, its like walking around in slippers!